Rimmon Heights is located in the center of Manchester’s West Side. The neighborhood is bounded by the Merrimack River to the east, the Piscataquag River to the west, the Northwest Neighborhood to the north and Amory Street to the south. Most of Rimmon Heights is located on a large plateau-like flatland above the flood plains of the Piscataquag and Merrimack rivers, but below the towering “Rock Rimmon.” The neighborhood is accessed from downtown by the Notre Dame Bridge (Bridge Street bridge), the Nazaire Biron Bridge (Kelley Falls bridge) from the west to access Pinardville and Goffstown and by a handful of connecting streets along its northern and southern borders. With the addition of street car service in 1877, growth was able to extend farther away from the mills than previously. 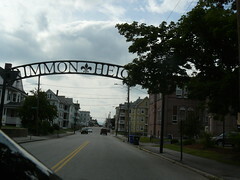 Rimmon Heights was developed largely in tandem with the mass immigration of the Quebecois which is still reflected in part by the street names of today. The Rimmon Heights group provides neighbors with resources to solve community problems, strengthen relationships among neighbors, create-maintain- promote a safe and clean community, and nurture our local businesses.